Fear and trembling characterize our return to the trail following our ill-fated descent of South Kinsman in our last section. (Click here to see) Still, we've had well over a month to heal, and Coleen's stepped up her exercise regimen to minimize the transition, her backpack-laden hikes around our development being the source of some amusement. It's time to try out the rehabilitated knee, and there's no place like Vermont, with hopes for autumnal color and trail of modest challenge. We've only got 10 more hikes to go, so it's time to "climb back on the horse that bucked you". "It is not the mountains we overcome, but ourselves." Our adventure begins with the familiar drive to the North Adams (MA) Community Club, where we've parked before for our MA section, and after signing in we head across the street to start our hitch towards the minuscule town of Danby VT. Normally we'd hire a shuttler for this purpose, but all the local ones are busy this weekend (and the bus schedules don't suit our own), so we've resolved to stick out our thumbs and cast our fate to the four winds. It's far tougher than we'd imagined, with easily over 100 cars without a nibble before finally hitting paydirt from a guy heading about halfway down to Rt 7, where we're going to hitch northbound. From here we end up hoofing it, Coleen lagging as we both break into a sweat this Indian Summer afternoon. It's quite a bit further than we thought, but finally we�re at the corner of 7, where almost immediately a couple college kids in a beat-up sedan veer in our direction. Out for a Saturday drive to Bennington for dinner, we seem an amusing diversion for them, and off we go. We're there in no time at all, and on asking our destination, I throw out a proposition � would they take a little legal tender for a ride on to Danby? Being typically poor college kids, they gladly consent, and we�re headed to Danby, listening to the Beatles White album (where are my bell-bottoms, anyway?). We find Danby and wind up USFS 10 to the trailhead easily enough, and after our goodbyes, we're off, finding the path surprisingly level and smooth. 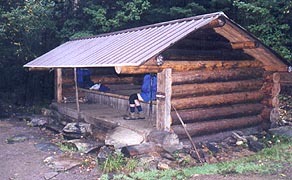 Passing Big Branch shelter we meet the 1st of many thru-hikers this trip � heading southbound on a flip-flop. 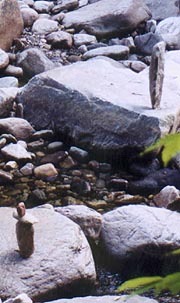 Big Branch itself is a rocky creek filled with dozens of cairns � small columns of stones, many built on as precarious a perch they can be balanced on. A suspension bridge ushers in our gentle climb into the woods, soon passing the Lost Pond shelter, finding it truly lost, victim of a fire in 2001 (though a couple families out for the weekend are camping here). After a brief chat we forge on towards our break on the rocky overlook atop Baker Peak, followed by a gradual, but rocky descent that slows Coleen a bit. A Prairie Home Companion fix entertains me as Coleen listens to her MP3's, and soon night begins to fall, the headlamps coming out as the path gives way to a lengthy series of puncheons around Griffith Lake. Around the tenting area a few tents are illuminated by lights within, and as we ponder our options here, the caretaker emerges to collect our fare. We find she�s Tortise, having just finished her 16-yr section hike this August. After paying our $12 and weighing the options (a light drizzle is already beginning), we opt for the additional half-mile to the Peru Peak shelter, offering a roof over our heads. It�s a short trek through the night, and the shelter is spacious, clean, and all ours - more importantly, the heavens burst forth with rain immediately on arrival, which continues throughout the night and the next morning as well. We can�t help but reflect on our good fortune and timing as we dine on our sandwiches with hot drinks. We turn in at 10:30, though sleep is slow in coming with the pounding of the rain and the warm, muggy night air. "Good judgment comes from experience, and experience comes from bad judgment". We wake to a dark rainy morn, but at least we�ve a dry place to pack, a couple hikers passing by wordlessly as we pack. We're out at 8:08, enjoying the fragrant damp forest as a light rain drums on the leaves above, shielded enough to walk without rain gear, only our packs covered. 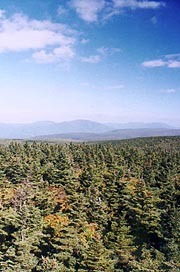 After the fairly level section past Peru Peak and Styles Peak, the trail descends to Mad Tom Notch, by which time the rain�s largely ended, though the peaks remain shrouded in cloud. The woods are full of weekend hikers, and our route now climbs to Bromley Mt, a popular skiing area, the final steep climb finding the summit shrouded in fog. There's a futuristic ski gondola (looking like one of the Star Trek shuttles) and a cavernous warming hut that's available for overnight stays. It�s a nice hut (though there�s no water), and a comfortable place out of the dampness for a few minutes to catch up on our navigation. After a few minutes here we follow the trail to a ski slope marked "Easiest Way Down" (a new AT experience - even though it�s a beginner's slope, it�s surprising how steep it is to walk down). Soon we return to the woods, descending to VT 11, the busy road from which many hikers hitch into Manchester Center, called a �yuppie Gatlinburg�. We�ve thought about a town lunch, but prefer to push on for a night in Bennington, so on we go, taking our break at Spruce Peak shelter. Here we run into a couple guys hiking the LT as a cancer benefit. It�s a great shelter and we�d love to stay and chat, but we�ve miles to go, so we push on, hoping to stop near the William B. Douglas shelter, still 3.5 miles distant. The shelter is � mile off the trail, so we�d hoped to camp nearby, though the guys at Spruce Peak can�t recall much about sites or water there. The day�s dragging, so we get out the Walkman and MP3 player to salve ourselves with music, and soon the trail joins the remnants of a gravel road that makes for easy miles and the rare AT luxury of side-by side walking. It�s a nice end to our long day, though we�re still left with the choice between tenting by the trail or walking down to the shelter. Showers are still forecast for tonight (though it's cleared nicely), and though the shelter trail passes a rushing brook, the only tentsites we find abut the trail, and aren�t nearly level as we�d like. We choose the shelter, finding the � mile was a gross exaggeration, with the shelter barely half that down the seriously awash path. The ancient shelter is found at the corner of a small meadow, barely cut out of the weeds there, and exceedingly dark inside. Still, we�ve a roof and a small trickling spring adjacent, and Coleen heads down to the larger brook for a quick cleanup as I toy with starting a fire. Wood is sparse and wet, but with the alder bark I manage to get one going, although it�s more curse than blessing, as the wind rises with the clearing skies, swirling through our narrow space to ensure that the smoke�s almost continuously blown inside. Still, it's a reasonably pleasant evening, with dinner and hot drinks before retiring at 9:30. 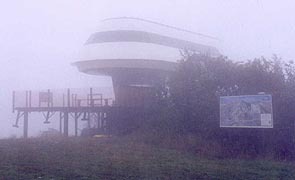 The Bromley Mt ski lift looms out of the cloud - looks as though a shuttle from the Enterprise lost their way. The small print says, "Easiest Way Down" - both captions have some truth to them. "There is no such thing as a problem without a gift for you in its hands. You seek problems because you need their gifts". Today is to be our long day if we�re to make a town night tomorrow � a plan to which we�re pretty well committed. 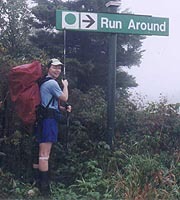 We�ve discussed tenting halfway to Bennington, but Coleen�s in favor of pushing out a few more miles to the Kid Gore Shelter, a full 20 miles away. So, when we wake after another stuffy night, I prod Coleen out of our dark and dank perch, finding that nothing has dried much. We're out once again at 8:08, though at least the trail up to the AT is no longer a river. It�s another gray, dark day out, a little rain spitting occasionally; and the legendary Vermont mud rears its head today, with me burying a boot several times. We�re praying for clearing by the time we climb Stratton Mt � our big climb for the day, and the mountain on which Benton MacKaye is said to have conceived the idea for the AT with its unbroken trail from Georgia to Maine. It�s a level trail over the rushing Winhall River to the alpine Stratton Pond, where the west wind laps the waves loudly against the banks as we wind around the shore. Returning to the woods, we take a short break before the 1500' assault on Stratton Mt. It's a piece of cake compared to the Whites, but it seems endless with the moderate grade; though the weather clears nicely as we climb. I�m surprised to find a cold, clear, and surging spring at the summit (and we�d carried lots of water up as the guidebooks don�t advertise any water here), and suddenly the balsamic firs open to reveal the fire tower and caretaker hut at the summit. Coleen plops onto a bench here, and I shed my pack for a quick run up the fire tower, though the frigid west wind drives me back as soon as I get above the treetops. Caretaker Jean comes over to chat and we find they�ve been doing this every summer for 30 yrs; and that we�d talked to her husband (Hugh) on our 1998 visit here. We linger a while under the clearing skies chatting with Jean before our long day impels us onward, finding the slope down rocky and moderately steep in places. We take a lunch break near the bottom, finding our lunch log in the midst of a raspberry thicket which proves a great accompaniment to our usual fare. The afternoon and miles wear on us both, especially Coleen, although she keeps up well, with the Walkman and MP3 players getting us through the miles. At Story Spring shelter we chat with a couple hikers - fun guys, but we�ve lots of miles left, and by now we�ll be pushing dark should we continue to the shelter. Coleen�s iffy about it, but as we pass our last sure water source we feel like pushing on, stopping only briefly to look for moose (as we do at every marsh). We�re beat, with a couple hours to go, but Coleen�s accepting of our fate, as there aren�t any better alternatives. It�s an endless traverse around an unnamed mountain, and the rocks begin in earnest again, compounded by the rapidly fading light. Soon we don the headlamps, with no sign of the final descent to the shelters, but we press on and finally it begins - steep and rocky indeed. Darkness and the rocks slow us to a crawl, and the shelter never seems to come, but finally we reach the bottom. The map shows the shelters partway up the next climb, and we finally reach the old, decrepit Caughnawaga shelter, said to be a mere 250� from the much newer Kid Gore shelter. It's a chore to find which way the AT departs from here (the blazing has gone to hell lately), butfinally we find the trail, a few minutes later reaching the short side trail to the shelter. It�s rocky and muddy, but as we arrive (8:30), we see a candle burning on the table, and a hiker still awake in one of the bunks here. As the guys at Story Spring advised, it's Spanky, a VERY talkative but nice guy, having left his wife and 8 kids in Miami to do this walk as a benefit for underprivileged kids on Aug 1. Coleen�s not up to the water search tonight, so I head down to designated spring, finding little more than a mudhole, but heading back to the AT where I find a pool big enough to scoop up a bagful, and soon supper is served. We�ve a beautiful view of the moonlit valley below, although there�s a strange diffuse glow at its bottom (tomorrow we�ll find it to be moonlit fog over the lake in the valley). The wind is rising, bringing with it colder weather (a welcome relief from the last couple nights), and Spanky turns in soon after, ourselves finally getting our gear organized on one of the wide bunk platforms, turning in at 10:30. 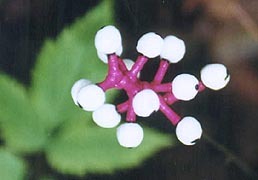 Can anyone identify these berries? 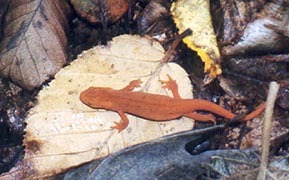 It's a beautiful clear morning out, with Spanky getting up and out a few minutes ahead of us. We�re out at our typical 8:10, finding the trail full of Long Trail hikers, and we exchange the typical info with them, many of whom Spanky's briefed about ourselves. We take a break at the fire tower atop Mt Glastenbury, climbing to the top to savor the view, though it�s mostly just a sea of green. As we head down the back side we pass the spacious and clean Goddard shelter, with a commanding view of Mt Greylock � a great place to spend the night as we�ll tell the cavalcade of hikers heading that way. After our lunch break at Porcupine Ridge, I start asking hikers about hotels, and one recommends the Safford Inn B & B, which sounds a bit more fun than a motel, even if it means a later start. We descend through Hell Hollow with one final climb over Maple Hill, and then the continuous descent to VT 9 begins, with Coleen�s feet and knee both starting to give her some pain. The poor blazing becomes apparent as well, as every time we cross a road or other path we end up searching for which juncture to be correct; with the final descent rocky and steep, as expected. Finally we pull onto the road, with a parking lot not far away; and we immediately get into our hitching mode. It works amazingly well, as the 2nd passenger car (a Mercedes, no less) pulls over, with a nice lady inside. We'll find her the new-agey Veda, from Francestown NH, here to visit some museums in search of historical information. On finding we�re looking for a B & B, she offers to take us to the one she�s bound for, which turns out to be the Safford Inn as well � very providential. Moments later we�re there, welcomed by Sandy, who�s got a room for us as well; explaining the ritual as we clean off and drag our packs inside. She offers us an early breakfast and suggests a place downtown for dinner, although our 1st priority is a nice soak in the tub. As night falls we head downtown for dinner at Carmody�s, a semi-Irish place with a nice menu (all of it high-fat), for a good meal at a premium price. We settle in to watch tv with a bag of popcorn, retiring in the lap of luxury. Overnight, we're treated to the intimate details of the upstairs folks'lives, courtesy of the thin floors (some of which give us broad smiles as we meet them at breakfast). We rise early, starting a pot of coffee in the room, though a peek outside finds Sandy well under way with breakfast. We start out with some OJ, followed by delicious blueberry pancakes and sausage, leaving us both sated without even getting to her further offers of eggs, omelets, English Muffins, or toast. As we�re done, Veda comes down, immediately offering to take us back to the trailhead � a gesture well appreciated by Sandy as she�s got a full schedule this morning. As Veda finishes her breakfast we load up the car, and after settling our $55 bill we head for the trailhead, unloading with our eternal gratitude. Just as we�re ready to head out, a a section hiker comes running across from the parking lot, seeking a shuttler in the area (something to do with a partner dropping out on him). I�ve got my little list, so after satisfying him, we�re on the trail at 8:40, beginning with the steep climb out of the gap. It�s a bit of a chug, but the trail is well manicured, with stone steps much of the way (though the typical lack of blazes that causes us to miss one turn, forging up the rockpile to a dead end). Eventually it levels though, and we�re able to put some speed on towards our car 18 miles distant. Shortly after leveling off, we reach a meadow with paths weaving through in all directions, none of them blazed. Although I guess they all intertwine, we get out the map, finding ourselves on Harmon Hill, with a good view of Bennington before we head off to the south, quickly finding the main channel of the AT. 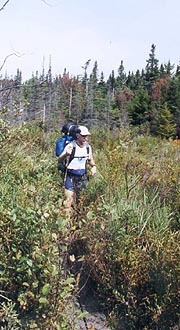 We speed along the level path, with brief stops at Congdon Shelter and Sucker Pond, taking our lunch break on some large rocks under a powerline that we�ve deemed the halfway point for the day. Some huge round boulders in the woods barely draw a passing interest as we speed on towards our final stop at the VT / MA state line. There's a short segment over Eph�s Lookout where the conifers oddly change from firs to pines, the trail beneath us turning to white sand; but again it scarcely slows us as we drive towards the finish. Soon the descent starts in earnest, with a steep traverse of a rockslide filled with huge boulders that even offers a bad-weather abort. It slows Coleen considerably, and even I have a tough time finding the AT amidst the rocks, but soon we�re clear for the placid descent from here into town. We join the pastoral Sherman Brook, fronted every few feet by No Camping signs, although approaching town we begin hearing the voices of kids that quickly go silent as we pass (great party sites here). The trail spills out through a residential yard onto the street, with a bridge crossing a railroad yard and the river. Finally, as dark falls, we reach MA Rt 2, from where we left on our MA section two years ago, and moments later we're back at our car. It's been a far easier section than we'd imagined, and we're both in good health, also beyond all expectation. We're both pleased with our progress and Coleen's recovery, so now it's time to really jump into the deep end - next month, Maine! !